Welcome to the Website of Aizunonattoyasan. We hope that you enjoy your stay here and find the information useful. Aizu Wakamatsu City Fukushima Pref, Japan 会津の納豆屋さん　ここからお入りください　Enter here. Japanese font is required to view this site. Best viewed with Internet Explorer5.0 or later ／1024×768 resolution. Last Updated on November　２２、霜月（小雪／二十四節気）２００９. We are pleased to introduce our firm, Ganso Shiraitohonpo Limited to you. Our factory is located in the small city of Aizu Wakamatsu. Our company was established in 1616. We are a long-established food maker company. 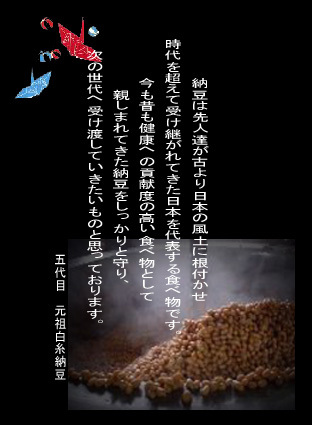 Our main products are Natto of ferment food. We have the latest specialised knowledge, skills, greater productivity and efficiency. We believe that we have continued to provide valuable products and services to Aizu. Natto has needs as a health promote and preventive medicine. and the culture of Aizu by the concept of the Ishokudougen. Please do not hesitate to contact us if we can be of any service and question. We are looking forward to servicing you at your convenience.